About Me | Pictures without film. Bio: Assistant Acquisitions Librarian (I buy books). Double bass player, songsmith and keen photographer. 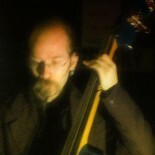 I play a bass called Tallulah in a band called Kantref (www.kantref.co.uk) that plays French and Breton music for dancing. Want to buy prints or printed goods with my photos on them? Want to buy prints or digital copies of my photos? What an interesting chap, so nice to meet you!